Built in 1591 at the behest of the warrior Toyotomi Hideyoshi, the Wall of Kyoto was one of many reconstruction efforts after years of war. It proved to be a very weak defense. 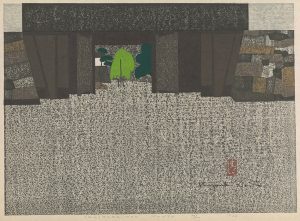 By contrast, Saitō’s abstract representation of the wall creates a strong visual obstruction through its constrained view, making the subject of this print ambiguous and mysterious. The composition harmonizes geometric division of space with the contrast of smooth and grainy texture, flattening architectural space into an abstraction. The neutral tones of black, grey, and dark red allow the print’s pebbly and grained texture to come into view as a primary feature. The dark colors of the wall suggest an inherently mysterious time of day—perhaps dusk—as the wall is still visible but casts heavy shadows. 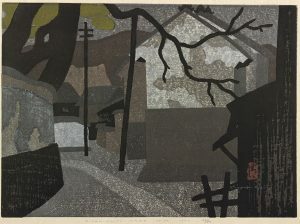 As in other prints, Saitō weds European-inspired modern abstraction with Japanese-inspired areas of flat color, an articulation of the contemporary relevance of his historic surroundings. This print represents the region outside the Biyakugo-ji Buddhist temple in Nara, Japan. This temple was devoted to a new Buddhist sect of the Kamakura period (1185-1333). While old Buddhist temples occupied the city center, the new temples existed outside of it. 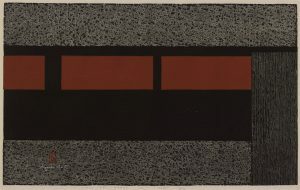 The linear perspective of this work directs the viewer’s gaze down the alley and into the enclave in the corner, leading the viewer to visually walk down the path. The straight lines that form the architectural structures contrast with the heavy, curved branch that hovers over the structures. 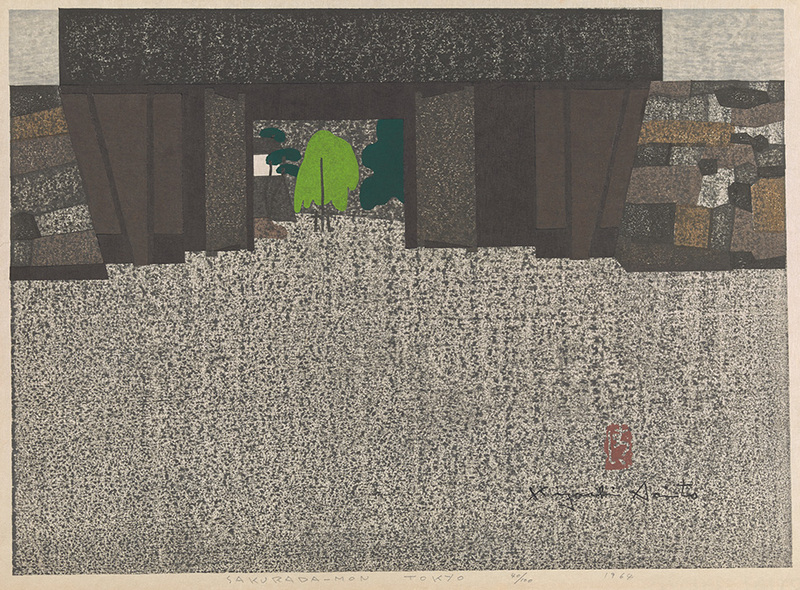 The dark tone and meandering composition channels Saito’s personal associations of distance, loss, and abandonment with Buddhist temples: in his youth he was forced to live in a Buddhist temple when his mother passed away. Sakuradamon, Tokyo illustrates one of the gates of the Edo Castle, part of the historic fortification that was first constructed in the 15th century. In 1860 this was the site of the assassination of Ii Naosuke, a powerful political figure, by anti-government protesters who opposed the treaty to open up trade with the West. Saitō channels cultural tensions of his own time between Asian and Western influences through a range of aesthetic decisions. Compositionally, he manipulates the landscape by constraining space and uses a top-down perspective in order to collapse foreground and background into a single plane. 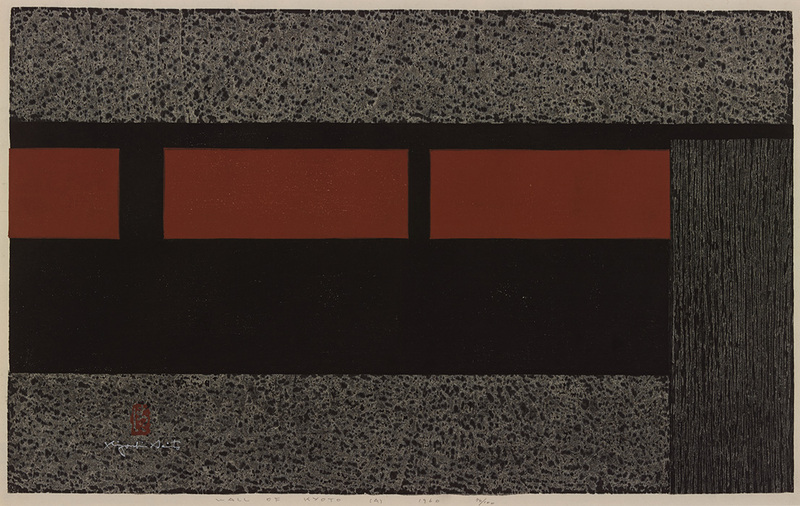 The dark and earthy hues and embossed texture are used to fill in simple, abstract shapes that form the scene. 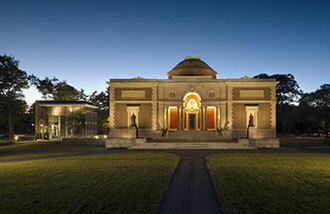 The vast space of the gate’s exterior contrasted with the compressed interior creates a sense of distance, evoking feelings of longing and nostalgia. Through the abstraction of this landscape, Saitō connects his conflicted artistic identity with the historical and cultural clash of the landscape.